Global sourcing in the first quarter of 2019 is still largely shaped by the fallout of 2018, in which US-China trade wars shook up the global sourcing landscape and drove many buyers to new markets in an attempt to escape the worst of tariffs’ hikes and future-proof their supply chains. This barometer takes a deep dive into inspection, audit and testing data collected by QIMA in the first quarter of 2019, to identify the potential trends and risks that global trade may face this year. Meanwhile, manufacturers in the rest of Asia continue reaping the benefits of last year’s biggest sourcing trend – diversification to sidestep tariffs and optimize costs. 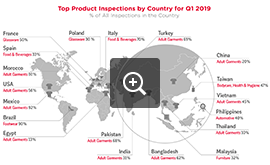 China’s regional competitors, such as Vietnam, Indonesia and Thailand all show robust growth, as demand for quality control and supplier audits expanded by over 20% YoY in Q1 2019. The dynamics among South Asian textile powerhouses are even more vigorous, with Bangladesh and India inspection and audit volumes spiking by +57% and +25% YoY in the first quarter. 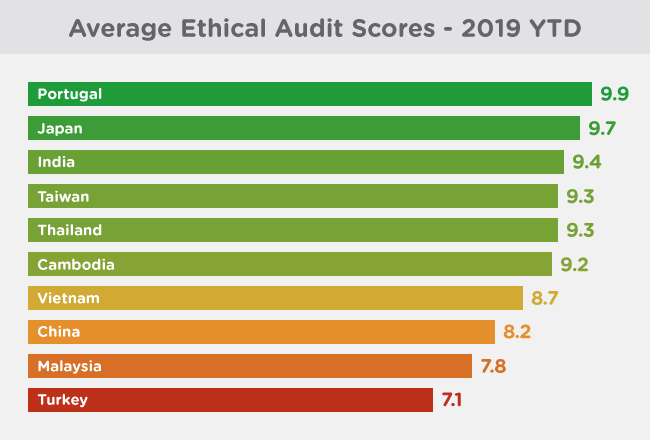 Data collected by QIMA auditors in the first quarter of 2019 shows a slight improvement in overall ethical audit scores: +6% compared to 2018 averages. In China, ethical scores increased by roughly 5% this quarter (8.2/10 from 7.8/10 in 2018) – an uptick largely attributable to improved waste management, which suggests that China’s anti-pollution policies are bearing fruit. Nevertheless, waste management remains at the top of the list of most pressing compliance issues in factories globally, along with working hours and wages. In another area of concern, Health & Safety, scores improved somewhat in Q1 2019 after last year’s flat performance, but a closer look emphasizes the need for continued scrutiny. For instance, in dedicated structural audits, QIMA’s civil engineers found that over 55% of inspected factories needed remediation in the short and medium term. In South Asia, over 80% of surveyed factories were unsafe, a figure that echoes recent concerns about the Bangladeshi RMG industry being unready to manage factory safety independently after the end of the Accord on Fire and Building Safety. Looking at specific industries served by QIMA, auditors recorded continued incremental improvement of ethical scores in the Textile and Apparel sector, while compliance was lackluster in the Toy industry, where only one-third of factories received “Green” scores on compliance with audit requirements in Q1 2019. 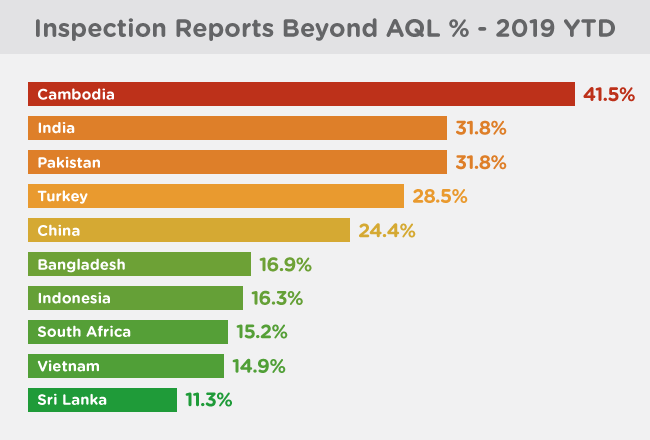 Onsite inspection data collected by QIMA in Q1 2019 suggests that after a year of being battered by sourcing diversification in Asia, China is still reluctant to give up ground to the competition. Case in point: following the disappointing performance in 2018, Chinese suppliers are making clear attempts to improve the quality of their outputs, as inspection results saw a +13% YoY improvement, with 24% reports found outside acceptable quality levels. 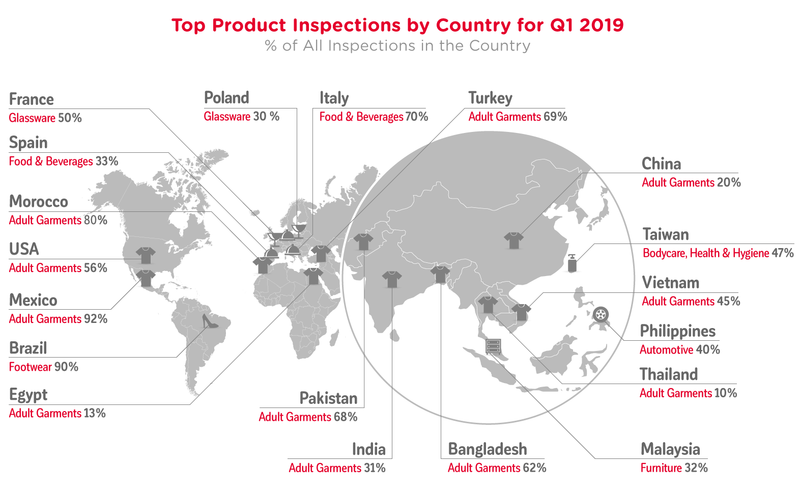 This puts China ahead of some of its regional competitors, particularly the textile powerhouses in South Asia, such as India and Pakistan, where over 30% of inspected goods came up short of specifications this quarter. In the Food industry, the ride is bumpier for China: in Q1 2019, over 51% of processed food products inspected in China failed against the specifications (compared to an average of 42% across all countries served by QIMA). The summarized data collected by QIMA inspectors and auditors suggests that Chinese food manufacturers, despite working hard to comply with the country’s ever-evolving food safety laws, still have a long way to go before they catch up with international standards. Meanwhile, manufacturers of Toys and Children’s products appear to be struggling with delivering on spec: during four out of five of the past quarters, over 29% of products in this sector remained outside acceptable quality limits. This poor in-factory quality is in contrast with decent performance in lab: QIMA’s Q1 2019 data shows test failure rates for toy shipments dropping by 13% compared to 2018, including improvements in compliance with phthalate bans. This disparity between in-factory and in-lab results suggests that the ongoing quality issues in the Toy industry may be more execution- than design-centric.